Since we're friends (are we friends? I consider you a friend.... you probably consider me as some kind of weirdo who essentially talks to herself through the internet.... moving on), I think there's something you need to know. You see, people ask me all the time how I come up with recipe and post ideas for the blog. They look at me expecting some big secret, some fancy formula, some detailed plan of creativity.... but they get the polar opposite. You see, friend (I'm calling you my friend, you just play along).... there's no secret. 9/10 when it comes to creating recipes... I wing it. In fact, I wing it so much that I just googled the definition of wing it to ensure that was indeed an accurate description of my throw-everything-together-and-hope-it's-a-success kind of cooking. In case you were wondering; to wing it means to improvise. To do something without proper preparation or time to rehearse. That pretty much sums up the scene in our kitchen most days. 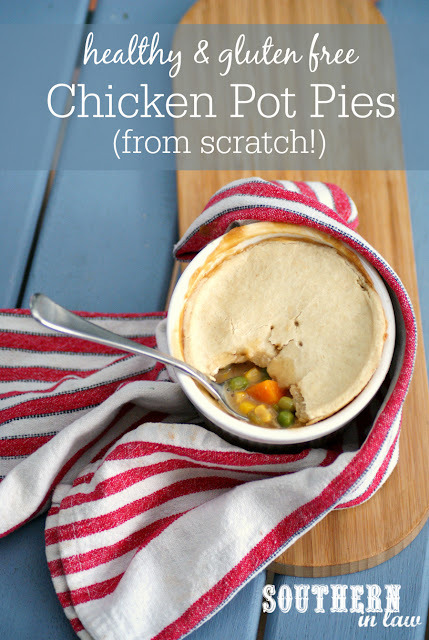 When I decided to make these Healthy Chicken Pot Pies for the first time, I was doing exactly that. You see, I'd never in my life eaten a chicken pot pie, I'd never cooked a chicken pot pie and I'd never actually seen a chicken pot pie in person... but that's what I told Jesse we were having for dinner. In these situations, there's two end results; I either succeed with no idea how it happened - or I fail miserably. This time I succeeded and seeing as I've made them many many many times since, I thought I'd share this delicious success with you! You'll need my Easy Gluten Free Pastry Recipe. Only use as much water as needed to just form a dough so that your mix isn't too sticky. I don't even bother chilling the dough when making these and simply roll the pastry out right away between two sheets of baking paper. See the notes below for our tips for leftover pastry! Lightly grease two single serve baking dishes/ramekins and set aside. Prepare your pastry and set aside, making sure you only add just as much liquid as needed to form a dough so it's not too sticky or hard to work with. In a medium non-stick saucepan over a medium heat, add your onion, garlic, chicken and carrots and cook whilst stirring until your onion is soft and your chicken is cooked through. Add in your corn, peas and chicken stock and allow the mixture to come to a simmer. Add in your cornstarch mix and reduce the heat to medium-low, stirring to combine all of your ingredients. Add in your cream cheese, stirring to melt the cream cheese and incorporate all of the ingredients. Season your mix to taste with your salt, pepper and thyme and all your filling to thicken to your desired consistency (I like mine quite thick but you can play around with what suits you! ), increasing the heat slightly if needed. Be sure to stir frequently whilst your mix is thickening. Pour your filling mixture into your prepared ramekins until they're around 3/4 full and set aside. Roll out your pastry and place it over the top of your baking dishes, trimming the edges to fit and poking a few holes in the top to allow the steam to escape. 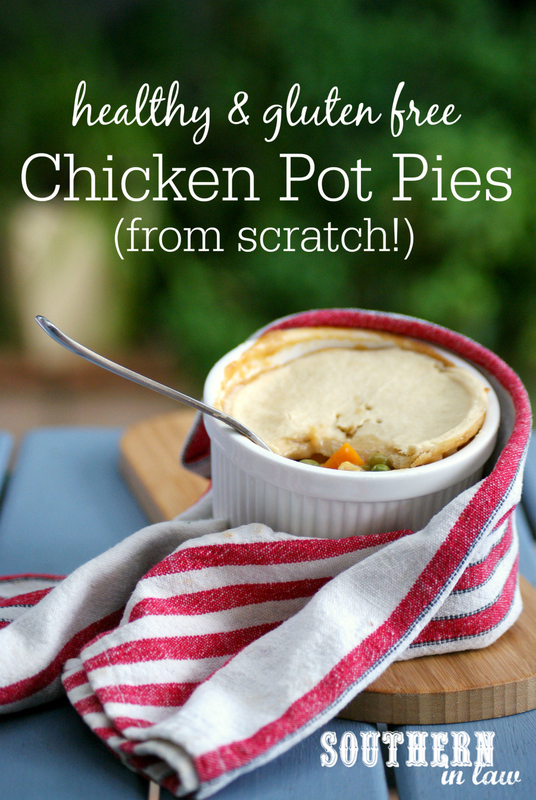 Bake your chicken pot pies for 20-30 minutes or until your pastry is golden and crispy on top. Cooking times will vary depending on your oven and the temperature of your pastry so be sure to keep an eye on them! If you have leftover pastry, we often like to use the leftover scraps to make "cheese crusts" by sprinkling some grated cheese over the top and baking until golden. You can also add pesto or ham/salami/pepperoni/bacon and make savoury scrolls/roll ups too! 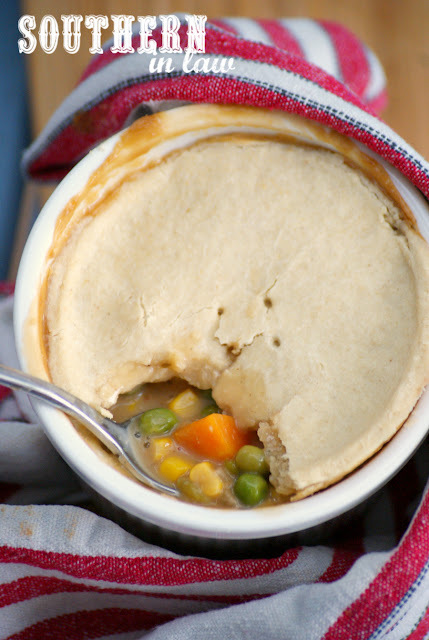 When cooking your pot pies, place your ramekins onto a cookie sheet so it's easier to get them into/out of the oven and so you avoid any messy spills! But tell me, what's your cooking "style"? Do you totally wing-it like me or do you like to stick to a recipe?